Why SPIDES is so important in incubation? If hatching eggs are stored for more than a week before being set in an incubator their hatchability begins to decline. When they are stored for longer than 14 days, the hatch loss can be substantial and is often hard to predict. Due to variable order patterns and sizes as well as seasonal fluctuations in demand it is not always possible to set all eggs within 7 days of lay. Prolonged egg storage affects both the dormant embryo and the incubation chamber (egg) that contains it. With increased storage the internal quality of the egg deteriorates, this affects both the albumen quality and vitelline membrane integrity. As a result of prolonged storage there will also be increased incidence of embryonic cell death. This deterioration of quality within stored eggs results in a higher proportion of candled clears due to increased early embryo mortality. Another consequence of prolonged storage is that eggs will take longer to hatch (implementing the hatch window) and there are typically an increased proportion of culled first day old chicks. There is evidence that strategically applied heat treatments during storage can advance the developmental stage of the embryo, taking it to a stage better able to survive storage. It is thought that these brief periods of incubation induce the repair/regeneration of embryonic cells, and thus minimise the damage induced by long-term storage. Research on this topic initially looked at treatments applied on-farm (pre-storage incubation), which aimed to advance the developmental stage of the embryo to one better able to withstand prolonged storage. This showed some benefits, but proved difficult to manage on a large-scale practical basis. The application of heat treatments during egg storage (Ar and Meir 2002) raised the possibility of applying this technique on a larger scale in the holding area of a hatchery or in a storage depot. This technique of short periods of incubation during egg storage became known as SPIDES. To date, the SPIDES technique has been found to give 2-4% better hatchability in eggs stored for 7-14 days and higher benefits when eggs were stored for over two weeks. 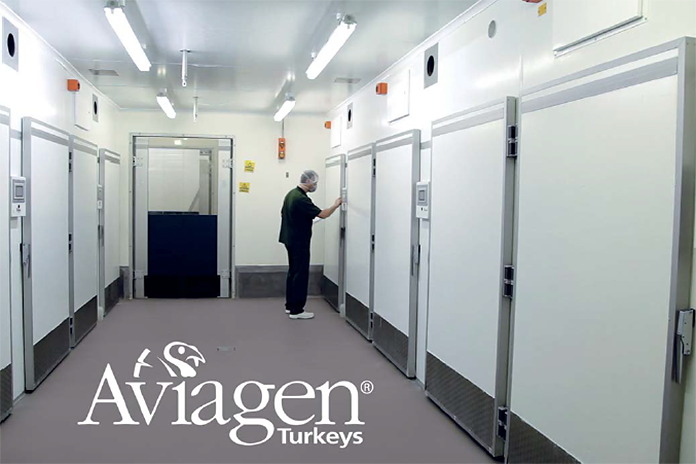 Following these successful trials with chicken eggs Aviagen Turkeys investigated the application of the SPIDES technique to turkey eggs. Several trials have been completed at Grantham hatchery. 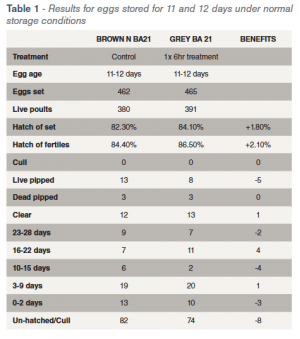 In one trial eggs were stored for 11 and 12 days under normal storage conditions. Half of these eggs were treated at 38°C for 6 hours on day 8 and then returned to the hatchery egg store until setting. Benefits were seen in hatchability in the group having the heat treatment over the control group. A second trial investigated the effect of egg turning in combination with a single heat treatment. The results from this work are shown below and demonstrate a benefit from the treatment including turning. There has been much less emphasis placed on research into the SPIDES treatment of turkey eggs which have been stored long term. However, it does appear that the basic principles which underlie the SPIDES treatment of chicken eggs are applicable to the treatment of turkey eggs. More work will hopefully continue on this topic. A single SPIDES treatment is sufficient to improve hatch in eggs stored from 15-17 days, but needs to be given on or around 8-10 days. 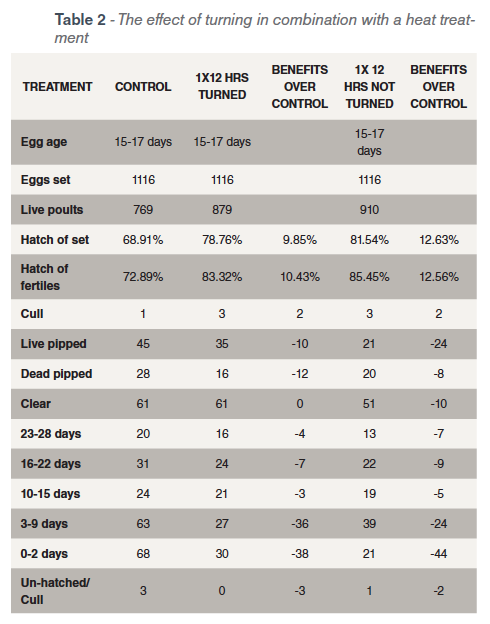 Hatch improvements can be greater if multiple (2 or 3) treatments are given depending upon how long the eggs are stored. Typically no more than 7 days should be left between treatments. Where multiple treatments are applied there should be an equal amount of time left between treatments. SPIDES works in all incubator models and types tested so far, so long as the heating times are adjusted as necessary. The effective temperature range for SPIDES has been found to be between 32 and 38 degrees Celsius. It is not helpful to pre-define a heat treatment in terms of time – as this will vary with egg numbers and incubator type. What is important is that the eggs are warmed to just below incubation temperature and then cooled. 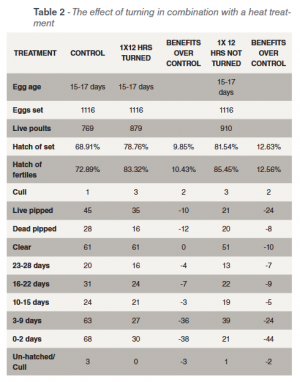 Greater hatch improvements are likely to be seen with eggs that have been stored for more prolonged periods and have lost a lot of hatchability – the higher the hatch loss, the greater the improvement. SPIDES treatments give a tighter hatch window – less hatch delay from SPIDES treated stored eggs. Infertile eggs will not be affected. It is possible to overdo the heat treatments and kill embryos. Total treatment time above 32 degrees should ideally be kept below 13 hours. 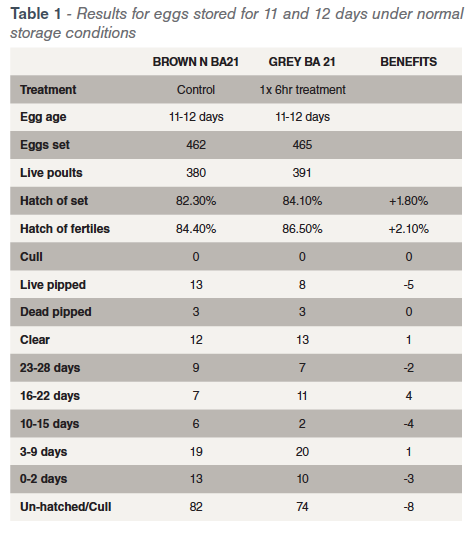 Poult quality will generally be better after SPIDES treatment compared to untreated eggs. Setting too soon after heat treatment can have negative effects.